Emeralds are by far the most represented colored stone in the abundant royal jewel collection once used by Iran's former monarchy. 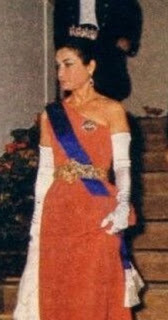 But when they did rubies, they did them well. 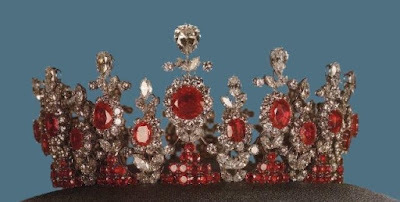 Pyramids of smaller rubies support clusters of large rubies surrounded by diamonds in this tiara, which is also accented with marquise and round diamonds and topped by a graduated series of pear-shaped diamonds. 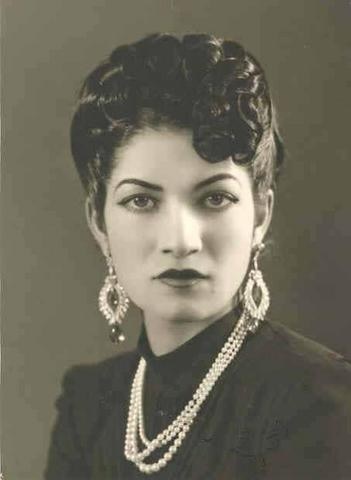 The ruby diadem was worn by Princess Ashraf ol-Molouk Pahlavi (1919-2016). I've always found this tiara to be among the ruby-iest of tiaras, if you know what I mean. Whereas many ruby tiaras are mainly diamonds with just a sprinkling of red stones, this one has a large number of rubies and showcases them well. There are some large and valuable stones here, yet the design has a lightness to it. It wears its carat weight well. 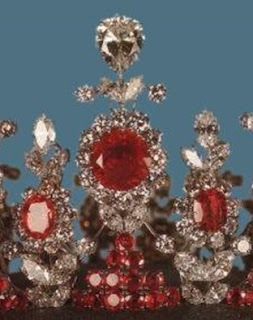 Princess Ashraf's Ruby Tiara made a strong showing when you voted for your ultimate ruby tiara, and I suspect it would have a place on the favorites list of many a ruby fan. So: A place on your favorites list for this one, or nah?